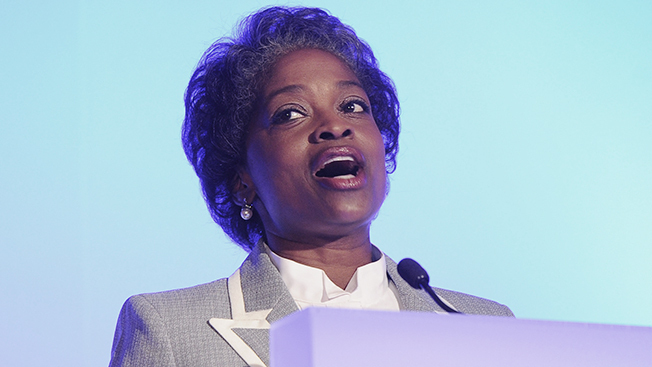 Mignon Clyburn (D) makes history today as the first woman to head up the Federal Communications Commission. That history, however, will be short-lived. Clyburn is only keeping the seat warm until the Senate approves President Obama's nominee of Tom Wheeler as chairman. Clyburn's first meeting as Acting Chairwoman will be June 27. "I assume the role of Acting Chair with a great sense of responsibility, but also great humility," Clyburn told the FCC staff on Monday. "And as we await the confirmation of Tom Wheeler, I see myself as a member of a relay team, running one of the middle legs. My job is to build on forward momentum, give the next teammate a running start, an improved position, and no matter what, my goal is not to drop the baton." Chairman Julius Genachowski (D) and Commissioner Robert McDowell (R) ended their FCC stints on Friday and both are headed to think tanks. Genachowski is joining the Aspen Institute and McDowell the Hudson Institute. The two announced their resignations within days of each other in March. How long Clyburn will serve as Acting Chairwoman will depend on how quickly Sen. Jay Rockefeller (D-W. Va.), chairman of the commerce committee, can hold a hearing on Wheeler. He originally hoped to schedule it for May and now that's slipped to June. If Rockefeller sticks to custom, Wheeler's nomination will not move through the Senate until it is paired with a GOP nominee, which President Obama has yet to name. In recent days, a number of names have surfaced for the GOP nominee, including Ray Baum, a senior policy advisor to Rep. Greg Walden (R-Ore.); former FCC staffer Michelle Connolly, a professor at Duke University; Neil Fried, the senior telecommunications counsel for the House Energy and Commerce Committee; and A. B. Cruz, the former chief legal officer for Scripps Networks. Until Wheeler and a GOP commissioner come on board, a process that could take months, the FCC will be doing business with only three commissioners.